My fascination with VW's (see my page http://www.dunebuggyarchives.com/DansBuggies ) started back in the 70's as a child. We had a couple of hacked up VWs that we used for running the camp roads in search of the elusive partridge. Later when I was 17 I got a 70 Type one and had hopes of building a Baja Bug. Well the old bank account couldn't handle the conversion so I sold it to my cousin. Fast forward 20 years. 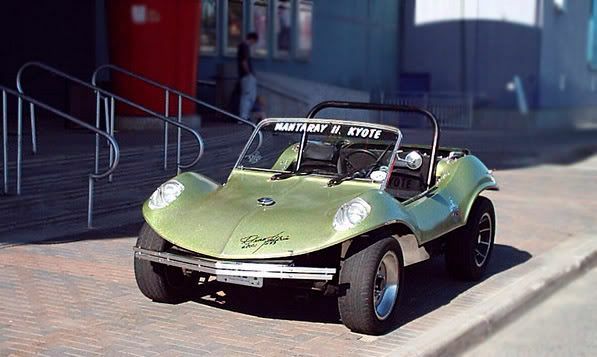 I located a 1968 Mantaray II Kyote and I was hooked again. This time however the bank account was doing much better and my skills in the automotive trade were finely tuned. During the restoration while hunting for parts I located many vehicles that needed my help. I could not bear to see them go to waste. So I took them home. Some even just appeared in my driveway. They must have heard I would save them so they came to see me.